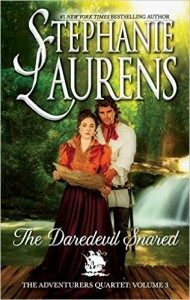 The Daredevil Snared is the third installment in Laurens’ recent quartet about the Frobisher brothers. This installment is about Caleb, the youngest brother, and Katherine, a women enslaved at a mine. The series is not one which can be read out of order, so if this is your first introduction to the Frobishers, turn back now. I was not familiar with the series when I picked this up and had to rely a lot on my mother, who is a huge fan of Lauren’s work, to help fill in the gaps. Some other reviews say they feel the story caught people up, and I would disagree. This series deserves to be read as intended, so I would not recommend jumping in at mid-point. The plot is thus: Caleb is tired of being the brother who everyone thinks is useless and decides it’s time to take part in a covert mission the rest of his brothers are on. He sails to Freetown and kicks off the next phase of their plan; to free captives at a mine. While there, he meets Katherine Fortescue, who was kidnapped from her job as a governess in Freetown, and is now being forced to work as an overseer of child laborers at the mine. When she meets Caleb in the jungle, hope long extinguished flames again. Problem is that the dude who runs the mine isn’t about to let his entire labor force go free and so Caleb and Katherine work together to set plans in motion. Along the way, the two fall in love (of course) and set up the actions for the final installment of the series. Just as point of note, while Caleb and Katherine have their personal happily ever after in this book, the story itself is not fully concluded. I know this pattern bothers some readers who detest cliffhangers, so be forewarned! If you’re a fan of Regency-era romances that take place outside of ballrooms, I would absolutely tell you to pick up this series. These are different dynamics than we’re used to reading, but with a lot of the same social forces at work. I appreciated reading about different parts of the globe, and how people in that time functioned in them. This series is also for fans of pirate tales, and slow-burn reads. This is hefty book (coming in at just under 500 pages) and the tale is paced methodically. If you’re looking to settle into a long read, this series may be for you. I added the rest of the series to my “to read” list and look forward to knowing the other Frobisher brothers in due course. I read this one with a lot of tea to help with focus! Intrigued by slave trade during the Regency era? Check out this article which provides some good background. I was provided with a complimentary copy of this book by TLC Tours in exchange for participation and an honest review. Thanks! I like that the action in this book takes place out of the typical high society arena where Regency romances normally occur. It’s a refreshing change of setting!